It is my greatest hope that we can place an increased focus on advanced breast cancer and create an increased amount of funding that is dedicated to those who are fighting for their lives on a daily basis with advanced breast cancer. One of the biggest misconceptions about breast cancer is that all breast cancers are alike and they can be cured but nothing could be further from the truth. The hardest part to understand is that treating breast cancer that is in the breast is one thing but when breast cancer leaves the breast area, everything changes. 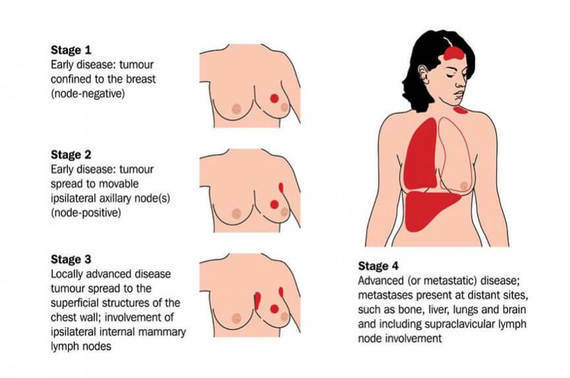 Breast cancer that is found outside of the breast is called "metastatic" or "advanced" breast cancer. For a much better explanation, I have included a link for easy reference. For those dealing with metastatic or advance breast cancer, the feeling is that they are often the forgotten ones when it comes to the focus that is given to breast cancer, particularly during Breast Cancer Awareness Month. It can be difficult for the general population to understand that breast cancer can be found anywhere but within the breast. Therefore, when breast cancer moves to the brain or bones or lungs or liver, the conception is that you now have brain cancer or bone cancer or lung cancer or liver cancer. However, this is not the case as breast cancer that has metastasized or moved to another part of the body is still breast cancer. This same thing applies to other cancers as well. For instance, lung cancer that has moved outside of the lungs to the brain is not brain cancer; it is metastasized or advanced lung cancer. In other words, a cancer is identified by its origin and not by a location to which it has advanced. Keeping this principle in mind, it becomes easy to understand why those dealing with advanced breast cancer have not been understood and/or heard by the general population. Most believe that with early detection, breast cancer can be stopped and/or eliminated at the source. However, even early detection does not assure that breast cancer has not already metastasized in some patients. Even breast cancer has its own individual DNA and how it acts and how it is treated needs to be adjusted based upon the individual. Furthermore, treatment with existing chemo drugs in advanced breast cancer varies greatly from patient to patient. A particular drug that may work well in one person may do so for only weeks or months before it stops working. That same drug in another person may never work. Certain combinations of drugs may be effective for one person with minimal side effects while the same combination in another person can be devastatingly horrific. As we look toward Breast Cancer Awareness Month in just a few short weeks, it is my hope that the messages that are shared out across the board will include an increased awareness of metastatic or advanced breast cancer in order to help this community. It is my belief that if the general population is made aware of the need for increased funding for those who are most in need of new treatment options and hope for a better future, more campaigns just might be created to specifically fund research in this particular area. If an emphasis can be placed upon finding the answers about how, when and/or why breast cancer metastasizes in the first place, the hope will then become that breast cancer can be stopped in its tracks before it ever has a chance to move beyond the breast area. For anyone who has ever dealt with breast cancer, there is always a fear that it will return even if it has been successfully treated. Can you imagine what it would be like if your hope for successful treatment is finding a drug or a combination of drugs that would stop the cancer from growing without making you deathly sick and never knowing how long that treatment might work - if at all? It is my greatest hope that we can place an increased focus on advanced breast cancer and create an increased amount of funding that is dedicated to those who are fighting for their lives on a daily basis with advanced breast cancer.